We own Atwood Oceanics (ATW) as we found the fundamentals to be gaining momentum and the technicals continuation to hold the uptrend. 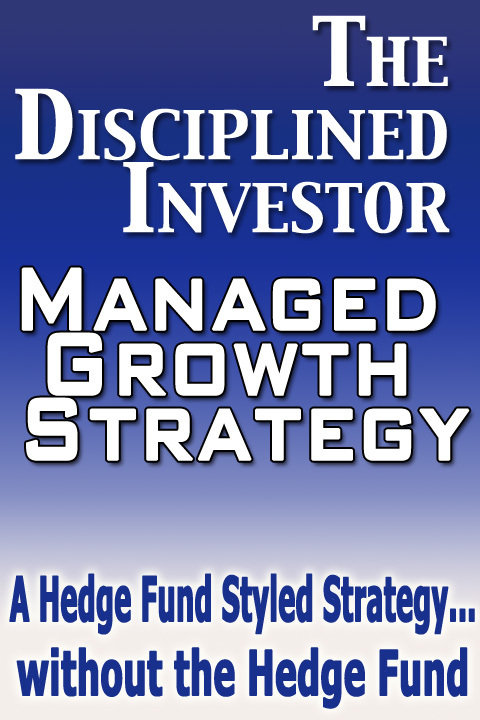 What we like is their execution and portability as well as their ability to adjust to market conditions. For the latest quarter (released 11/23/09), Atwood came in with inline earnings at $0.75 and beat on revenues by a narrow margin. Company Description: Atwood Oceanics, Inc., along with its international operating subsidiary, Atwood Oceanics Pacific Limited (AOPL) and related subsidiaries, are engaged in the international offshore drilling and completion of exploratory and developmental oil and gas wells, and related support, management and consulting services. 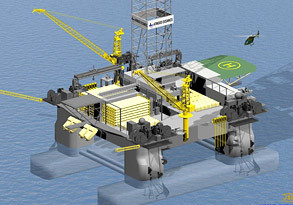 The Company‘s worldwide operations include eight offshore mobile drilling units located in six regions of the world: offshore Southeast Asia, offshore Africa, offshore India, offshore Australia, the Mediterranean Sea and the United States Gulf of Mexico. During the fiscal year ended September 30, 2008, approximately 97% of its contract revenues were derived from foreign operations. As of November 25, 2008, its wholly owned and operating rig fleet included Atwood Eagle, Atwood Hunter, Atwood Falcon, Atwood Southern Cross, Seahawk, Atwood Beacon, Vicksburg and Richmond. As of September 30, 2008, the submersible Richmond was the only drilling unit working in United States waters. 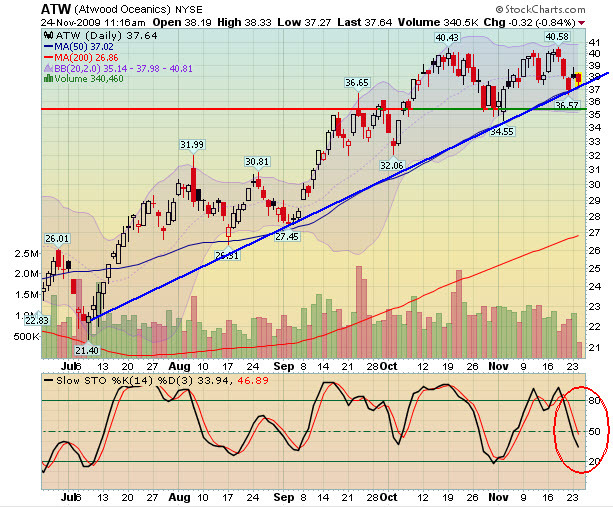 The technical trend is intact with solid support near $34.50. The slow stochastics are coming down but look to bottom shortly. Fiscal year was the 6th consecutive year of improving results. There was a change to the 8K, as they updated one of the contracts to show it was going to continue through March 2010. There has been an increase in bidding activity, although 2009 was very slow for deep-water drilling. Atwood has a $1.8 billion in contract revenue backlog. 70% of the available rig days are under contract for fiscal 2010. Several rigs are still under construction. In particular the Osprey currently in a Singapore shipyard (see below) . Under the 2 credit facilities they will pay off the rest of the construction. The Osprey will be available in 2011 with an operating day rate of $450,000 – $470,000. On Nov 15, Atwood commenced a 240-day contract commitment with Hess which has an option to extend. Day rates are coming in between $85,000 – $90,000 for a few rigs and there are others as low as $30,000. Atwood is looking to continue the expansion into international areas but; NO further growth beyond the two deep water rigs which are being constructed. For 2010, they executing on the current activities and focusing on building backlog for units with contracts rolling over and those with high utilization. 70% of available rig days are contracted and $600 million of contract revenues are already under commitment for 2010. Expense expectations are going to be in line with expectations and have not changed. 16-18% effective tax rate for 2010. Focus was on the Osprey, a Semi-Submersible.